We’ve talked in the past about how we strive to be different. It’s more than trying to stand out, it’s just how we believe business should be conducted. We don’t do this work to impress people, to win awards (although we do), or to become rich (though we did buy a Mega Millions ticket last week). We do it because, frankly, we love this stuff. That’s why when someone says something nice about you, it means more than that person probably knows. The line that strikes the biggest chord is this. “You’ve very much become a family for me and I will miss all of you in my move.” That’s really what we’re most proud of. That KC feels like we’re her FAMILY! That’s the culture that we try to develop here at Caldeon. One of love, hope, support, and success. 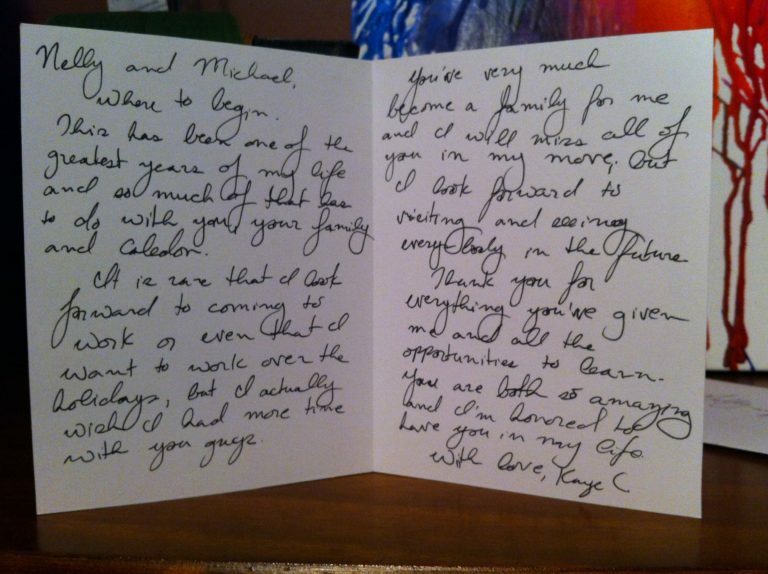 Even more than that, we received another note from KC recently, after she’d taken a position with Habitat For Humanity. We want to leave you with a quote from her message, and here’s what we want you to take away. Caledon isn’t about winning awards, or bringing recognition to ourselves. It’s about relationships, people, and teamwork. If this sounds like the kind of company you’d like to hire, or the kind of company you’d like to work for, let us know.